I mentioned the other day that I’ve started Professor Grant Horner’s Bible Reading Plan. You read ten chapters a day from books in the OT and the NT. One thing I enjoy about this approach is that I go through such a variety of books at the same time. Historical narrative, poetry, wisdom, philosophy etc. I am getting a feel for the “voice” of each writer. Which is doubly amazing because the uniform voice is God’s, through the Holy Spirit, But He washed His words through man’s brain and out his pen and so the distinctive style of each man come through. Paul’s warm regards in Thessalonians is so different from his clinical lawyerly philosophy in Romans. Below is one verse from Romans that caught my attention yesterday, and the Commenter’s note about it. Sometimes the shortest verse gives the most opportunity to meditate on His word. Much more, then – It is much more reasonable to expect it. There are fewer obstacles in the way. If, when we were enemies, he overcame all that was in the way of our salvation; much more have we reason to expect that he will afford us protection now that we are his friends. This is one ground of the hope expressed in Romans 5:5. As I grow by His grace in sanctification, the feeling of escape from wrath of God becomes more present. The wrath of God abides on all the lost. (Romans 1:18, Ephesians 5:6, Colossians 3:6…) This is something the lost feel, whether that admit it or not or whether they suppress it or not. Post-salvation, the relief one feels from having escaped the wrath transforms into wonder and gratitude. That terrible feeling of ever-present peril is removed. I am reminded of the story about the Sword of Damocles, from Wiktionary. 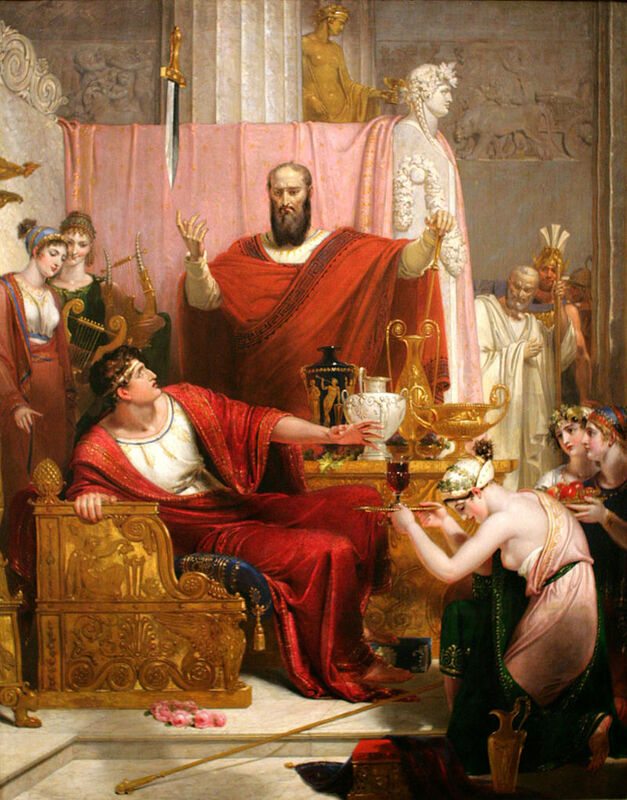 Damocles was an obsequious courtier in the court of Dionysius II of Syracuse, a fourth century BC tyrant of Syracuse. Damocles exclaimed that, as a great man of power and authority, Dionysius was truly fortunate. Dionysius offered to switch places with him for a day, so he could taste first hand that fortune. In the evening a banquet was held where Damocles very much enjoyed being waited upon like a king. Only at the end of the meal did he look up and notice a sharpened sword hanging directly above his head by a single horse-hair. Immediately, he lost all taste for the amenities and asked leave of the tyrant, saying he no longer wanted to be so fortunate. Dionysius had successfully conveyed a sense of the constant fear in which the great man lives. In Jesus, we have the ever-present hope, instead of the ever-present wrath. Such a simple fact, but profound. It’s one upon which we should be thankful every day. Never let this get old.